Intel® Xeon® E3-1200 v6 series, Intel® 7/6st Gen Core i3, Intel® Pentium® and Celeron processors. 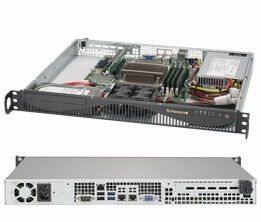 1U RackMount case with 200W power supply (80+ gold), 2 of 3.5" HDD bays (hot-swap). dimension - Width: 17.2 in. Height: 1.7 in. Depth: 14.4 inch.